There’s something about Adrien Brody that I just can’t put my finger on. Perhaps it’s the imperceptible hint of mid-Europe he carries about him. Perhaps it’s his ability to warp into any role put in front of him. Nonetheless, there’s no denying that he is able to transform himself at the drop of the hat. It’s no wonder, then, that he has undertaken the role of the greatest illusionist of all time, Harry Houdini, in a new two-part miniseries. Following the thrilling escapades of the magician’s life, Houdini offers a glimpse into the happenings of the world-class escape artist and illusionist. Featuring meetings with cultural figures such as Arthur Conan-Doyle and Rasputin, Houdini is truly steeped in another time, bringing the secrets of the past very much into the light of the present. 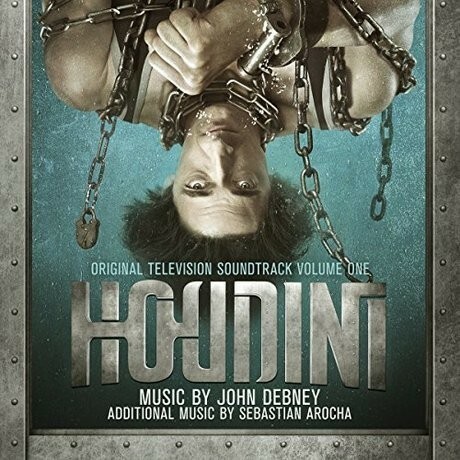 Celebrating a life outstanding is no small task and so it has been left to John Debney to live up to the majesty of Houdini in his televisual score. Having already left his mark as the youngest ever composer to receive the prestigious Henry Mancini Lifetime Achievement Award, Debney is no stranger to international accolade and acclaim. Taking inspiration from both the past and the present, he combines contemporary scoring methods with period instrumentation, producing a sound which is truly one of a kind. Debney balances electronics with gypsy strings and the zither “giving the score a very edgy and contemporary sound while always grounding the music with period splashes of style”. As if in direct conversation with the man himself, Debney’s score is out of its time, pushing into areas unknown and reconceptualising the present moment. From the opening cue, it is very clear that Debney is unafraid of pushing musical boundaries; his sound is dirty, distortion-loaded and heavy. Combining a number of different melodic arcs within each track, it’s clear that Debney has no shortage of musical ideas. Whilst cues can often suffer from a lack of musical coherency, there’s no denying that Debney is a skilled and varied composer. Despite his preference for electronics, it is in the traditional musical sounds that he really shines. Gypsy violin pieces such as ‘Father Gets Fired’ or ‘Money for Nothing’ are particularly chilling, the manipulated violin reverberating with sinister effect above pulsating bass lines. As well as darker tracks, there’s no shortage of personality in Debney’s scoring. Cues such as ‘Proposal’ utilise regular, staccato rhythms to reveal the lighter aspects of the TV series and the humanism which he is clearly capable of invoking. Although representative of a moment in the past, many of the light-hearted pieces in the score actually reference musical pieces present in contemporary culture. Debney’s bumbling use of the zither and his brass section in ‘Hitting the Road’ not only extend the jovial tone of the soundtrack but also reference current culture, such as the music from BBC series Sherlock. Despite these moments, the score can become overwhelming to listen to from time to time. Although propelling the soundtrack into the contemporary era, the electronic pieces can often become distracting to listen to, blaring and screaming to grab your attention. Whilst certainly dramatic, they often bleed into the melodramatic, detracting from the loveliness of earlier pieces. Cue ‘Is Harry Drowning’, for example, builds tension effectively but the ever ascending strings sound somewhat inevitable. If the other tracks are anything to go by, it is clear that Debney could have created something far more interesting in this circumstance. There are moments, however, when the electronics work very much in Debney’s favour. Cue ‘Bullet Catch Lie’ balances deep pulsing bass lines and electronic distortions to an unsettling degree, creeping under your skin and making itself at home. Debney’s use of electronics in this instance are truly subtle and it’s apparent that this is where he shines. Maintaining a constant volume and melodic arc, the sound is deeply affecting and truly lasting. What’s clear from Houdini is that Debney is a true maverick. Mercurial, wily and darting, it is impossible to anticipate how his score is going to move before you hear it. Despite a small number of melodic setbacks, the score is largely affecting, interesting and truly thrilling. It seems that, when composing, Debney took inspiration from the man himself, listening to no other and following his own instincts. And thank goodness for that. Debney’s score is untamed, chilling and moving and there has really been nothing like it created before.